Adding romance to your bedroom doesn’t have to begin and end on Valentine’s Day. February is already here, and as some would say, it’s the month of love. Valentine’s Day is a day that some people enjoy celebrating while others prefer not to. Whether you’re a fan of Valentine’s Day or not, you should always make sure your bedroom is a romantic retreat for you and your partner. Making your bed may seem like a tedious task in the morning but if you were to ask someone who makes their bed every day, what it’s like to get into bed at night, they’d more than likely tell you there’s nothing better than climbing into a clean, crisp bed at the end of a long day. Making your bed truly takes no time in the morning and studies show that it actually leads to a better sleep and more productive habits. To sum up, no romantic evening starts with a messy bed, it just ends with one. A collection of things lying around your bedroom is the last thing you should have piling up in this room. It makes the space unnecessarily messy and diminishes any romantic vibe you’re trying to create. Along with clutter, you should avoid doing chores in your bedroom like piles of laundry or other household projects. Even if you’re in the middle of making decisions for a home renovation – avoid bringing those items into your bedroom. When you remove clutter, you remove the thought of projects that loom over you and provide more mental and physical space for relaxation. If you’re thinking of bringing a home office into your bedroom, think again. Bringing a home office into your bedroom is a negative option for multiple reasons. Doing so emits stress and reduces a romantic ambience. With a desk always in sight, your mind will wander and mentally take you away from your rest and your partner. Ceiling lights are bright, daunting and unflattering. 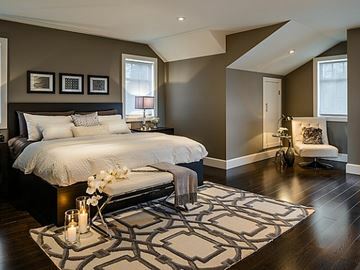 Add side table lamps or a dresser lamp to create mood lighting in your bedroom. Mood lighting is exactly that. It makes the space feel warmer and cozier which is extremely necessary in the long, cold days of winter. Find elegant bed-side table lamps that create glamour and style to the space – they’ll automatically make the room feel more appealing. The bedroom you share with your significant other should not only be a relaxing space, but a space that exudes love, without going overboard. Place wedding and family photos in elegant picture frames and put them on display on everyday surfaces so they can be seen and admired. Details like mirrors and trendy headboards are a great way to elevate the element of desire in your bedroom. Headboards can be treated like art in the bedroom. You can find stylish pieces that will pull all the décor elements of your bedroom together – similar to artwork.